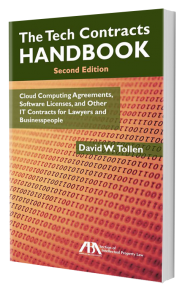 I use the table of contents from The Tech Contracts Handbook as an issue-spotter for software licenses, cloud computing agreements, and other IT contracts. I’m posting the table so others can do the same. Simply peruse the topics listed below and ask yourself whether your contract needs a clause addressing each one.